Merkko are pleased to announce the opening of their new branch in Aldermaston. 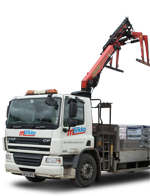 Merkko Builders Merchants is a well established business with over a century of experience in supplying a range of construction materials. With a range of over 2000 products available from 1800mm chamber ring to steel concrete lintels. We stock everything you need from underground drainage to a ridge tile.